Today I thought I’d show you why the Memory Joggers Systems work so well. I used proven memorization principles with all my products. You know how hard it is trying to teach instant recall of facts. You try flash cards and the only students who respond and like it, are the students who already know the answer. The struggling students tune-out the activity and learn nothing. You send home a note telling the parents to help their child remember the information. Well, that rarely works! By using pictures, stories, associations and rhymes, students have something to connect to. If an activity is fun, it is much easier to remember. Not all students learn in the same way. I designed the Memory Joggers products to meet the needs of ALL students. Some children learn best by using the visual areas of the brain. Others respond musically or rhythmically. And our kinesthetic learners use movement to remember. 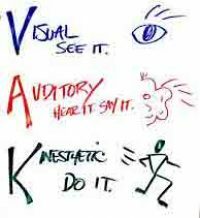 VISUAL LEARNERS – When students are visual learners, they remember the pictures easily. By reading the short story or rhyme, they are able to make associations to the numbers because that’s the way they learn. AUDIO LEARNERS –An audio learner is a good listener and this is the way they remember information. It is also necessary for them to speak and retell the stories or thymes in order to place the information in long term memory. KINESTHETIC LEARNERS – These children learn with movement. If they can become a part of the story and act it out, they will remember. The clapping rhymes for the Addition/Subtraction facts are perfect for these learners. What does all of this mean? It means that the Memory Joggers approach benefits ALL children, no matter what their learning style. It is so important to teach students to have instant recall of mathematical facts. Now there is a way to make it fun for them and easy for you!